A simple, but it seems heart warming tale of returning a wallet. What the synopsis seems to hint is that there is something that the police need for some reason. Probably for nefarious purposes. It’s the MacGuffin that keeps the plot moving forward. Ultimately what its contents mean as well as who to trust as the wallet gives up more and more of its answers. The poster does seem to hint that the answer is money. Or where to, ultimately, discover where it it. Can our friends outsmart the local police with the help of Father Julliard. We will have to wait until January 2015 to find out the answers. 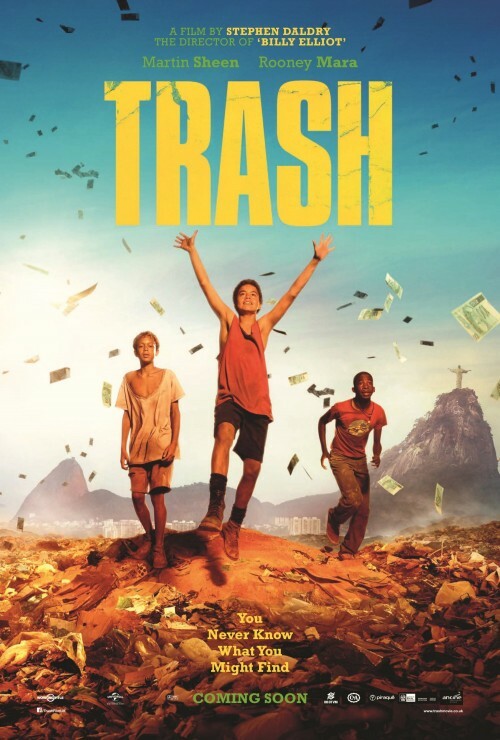 When two trash-picking boys from Rio’s slums find a wallet in amongst the daily detritus of their local dump, little do they imagine that their lives are about to change forever. But when the local police show up, offering a handsome reward for the wallet’s return, the boys, Rafael and Gardo, realise that what they’ve found must be important. Teaming up with their friend Rato, the trio begins an extraordinary adventure as they try to hang onto the wallet, evade the police, and uncover the secrets it contains. Along the way, the boys will have to figure out friend from foe, as they piece together the story of the wallet’s owner José Angelo and realise they can’t trust the police, led by the dangerous Frederico. But a pair of American missionaries working in their favela – the disillusioned Father Julliard and his young assistant Olivia – might just have the power to knock on the right doors.